Here is the latest installment in our Vintage Future series in which we take a tongue-in-cheek look at predictions from the past to remind ourselves that today’s trend can be tomorrow’s punchline. 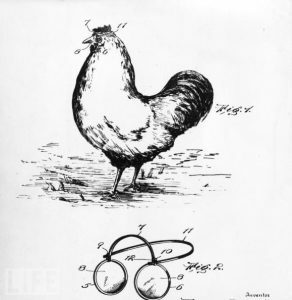 This time, crazy patents from LIFE: eyewear for chickens, animatronic rickshaws, moneyballs, dog power, and more. Think: someone went through the effort and expense to protect this IP. What has been will be again,” reads the Book of Ecclesiastes. “What has been done will be done again; there is nothing new under the sun.” Nothing new under the sun. Powerful words. But with all due respect to the ancients, they clearly never spent any time pondering the peculiar, mysterious world of patents, and marveling at the wonders revealed therein.